As with much property in Bingham, 9 Newgate Street was built on land originally part of the Shelford Estate owned by the Earls of Chesterfield and later the Earls of Carnarvon. The piece of land bordered by Newgate Street, Fairfield Street, Long Acre and the properties on Market Street (also owned at one time by the estate) seems have been attached to the 17th Century Estate owned farmhouse now No21 Long Acre. The Fair Field (presumably Fair Close mentioned in old directories) was part of this piece and was the site of an annual fair, from which Fairfield Street got its name. 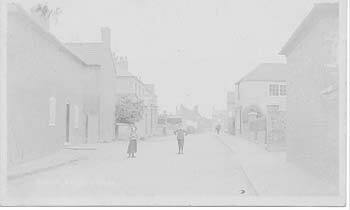 It was formerly Pond Street, there having been a pond in the field. The earliest papers for the property recite the history of trusts set up to administer the estate under the various Earls of Chesterfield. Some deeds for former Chesterfield properties (Abstracts of Title, usually the actual indentures are not present) recite the will of Philip Dormer Stanhope, 4th Earl of Chesterfield who died in 1773. The first papers in the deeds for No9 record the marriage settlement between George Stanhope, 6th Earl of Chesterfield and his intended bride Elizabeth Forrester, in 1830. The settlement related only to the estates in Nottinghamshire and Derbyshire. The daughter (Evelyn), who was the older child of that marriage, married the 4th Earl of Carnarvon. The earldom passed to the son George Philip who, the deeds recite, died in 1871. At this point the property passed to the 'Countess in trust' and on her death was to pass to George Edward Stanhope Molyneaux, the Lord Porchester. Pending that he was to receive an income from the estate of £2500 pa until age 21. In Evelyn's will the intention is confirmed, as she leaves the property, which is described as 'estates to which she became entitled on the death of her brother George Arthur Philip (7th) Earl of Chesterfield', to her son Lord Porchester. He later became the 5th Earl of Carnarvon who was involved in the excavations of Tutankhamen. She left £40000 to be divided between three daughters. The 7th Earl of Chesterfield had died without issue. Evelyn died in 1875. Meanwhile, the deeds relate, George Philip (8th Earl), who had inherited the title in 1871 from his great-great grandfather's other great-great grandson, died in 1883 and was succeeded by Henry Edwyn Chandos, who became the ninth Earl of Chesterfield, but did not inherit any interest in the Nottinghamshire and Derbyshire lands. His family name was Scudamore-Stanhope and, like the eighth earl, traced his succession back to the fourth son of the first earl. Subsequently there have been 10th, 11th and 12th Earls of Chesterfield. 1890 of Henry Molyneaux 4th earl of Carnarvon (Evelyn's husband). "Lease to be effective on completion of messuages to be built on the land, for 99 years from 25th March 1897, rent shall be two pounds ten shillings per annum payable quarterly on the usual quarter days". "Lease to fence property within 3 months of date of agreement and will by 1st January 1898 complete the building of the house and tailor's shop 'at the cost of £250 at the least". However, the present owners found the date 1895 written on the dining room wall under a layer of wallpaper, so it may be that, as with 1 Market Place, the house was actually constructed whilst the land was still technically in the occupation of the Earl. A rather faded post card from 1910 shows what may have been the original shop front. It projected forward from the right hand side of the house, where a bay window now is. The Earl's surveyor, James Augustine Rutherford, of Highclere (Highclere Castle is still the seat of the Earls of Carnarvon) had complete control over type and quality of materials to be used and was to agree works done. He was to approve detailed design. In particular the lessee also had to meet Local Authority requirements for dry closet or cesspit for sewage and to indemnify the Earl in this respect. The covenants included painting outside every four years and inside every seven years - colours to be approved and to keep property in good order. He was also not to use the premises as a factory, public house, club house, beer house or place for the sale of any alcoholic liquor or for any noxious noisy or offensive trade or business. On 8 December 1897 Sheldon Marson took out a mortgage with William Palethorpe, of Bingham, for £400. In a directory of 1888 William Palethorpe is mentioned as 'chemist, druggist and agent of Gilbey's Wine Merchants'. Mortgage loans between individuals seemed to be commonplace in the nineteenth century, and are recorded often in Bingham deeds we have seen. In 1914 Marson leased an extra plot to the south to use as a garden. Marson was still a leaseholder and paying an annual ground rent. The freehold was sold to him for £62-10-0 on 15th July 1920. The freehold to number 11 next door was sold in June of the same year. This is about the same time as Carnarvon sold other freeholds in Bingham. It would seem that he was raising cash for the digs in Egypt. photograph by Margaret Sibley Sheldon Marson died in 1935, according to our calculations aged about 81, leaving the property to his wife. By this time they were living in Worksop and presumably renting the property to a third party, but no details are recorded. Kelly's 1920/2 directory lists Ethel Ingram as a draper but unfortunately gives no address. A former neighbour recalls Ingram's drapers at 9 Newgate Street so would she have been the tenant? A drapery would be a logical successor to a tailor's, and indeed she sold wool, had a cleaning collecting agency and made wreaths. In 1948 Esther Marson sold No9 to Cyril Anthony Nicholson of Church View, the former name of No 19 Church Street. The price was £2600. 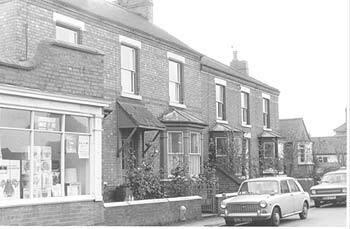 On 1st January 1959 Nicholson sold to Eric Green, later to be a Town Councillor and Mayor of Bingham. The same neighbour recalls Greens living there then so they must have been tenants of Nicholson's before they bought the property. The full address of the property is 7-9 Newgate Street but the deeds are silent as to why this might be and what might have been the use of the lean-to building on the side of the house, now the kitchen. Was it perhaps the tailor's workshop? Ingram's also used it for a basket weaving classroom and one could imagine them making full use of it to support their various activities. Mrs Green started a 'charity penny library' in the lean-to. The library was eventually taken over by the County Library who clearly perceived there to be a need in Bingham, which they could fill. About 1973 the library relocated in Eaton Square. The map is from 1974 and clearly shows the Newgate Street Library and the position of the new one in Eaton Place. The photograph was taken in 1973 after the shop front had been removed and shows the window display of library items, but the photographer remembers it had closed. The librarians were Mrs and, later, Miss Beeby, who still live in Bingham. One can see the patched brickwork where the door and large windows were on the blank wall to the left of the house. Although the vestiges of a porch are clearly visible around the present front door, there are no signs of repaired brickwork where the shop front would have been. In 1967 the extra garden plot was sold to the RDC - presumably as a precursor to the construction of Eaton Place car park. In August 1971 Green sold to Lillian Gladys Darch of 11 Newgate Street from whom the present owners purchased the property.